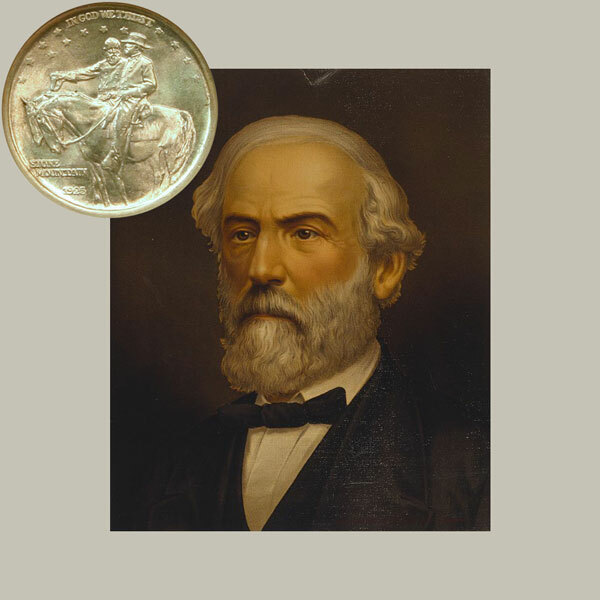 Today, the Stone Mountain Commemorative Silver Half Dollar coin helps us remember one of the leaders of the Civil War on his 208th birth anniversary—a type of man most people would like to meet. A man of strength, he let his actions and attitude define him, not the war. For further insights into the man, a group held a celebration for his 127th birth anniversary in January 1934. It was indeed fitting that the R. E. Rodes Chapter, U.D.C., present as guest speaker at its annual Robert E. Lee celebration Dr. George H. Denny of the University of Alabama who has long been intimately associated with the traditions of the Lee family, having served as president of Washington and Lee University in Virginia as did Robert. E. Lee, having made his home in the home that was formerly occupied by the Lees, and having sat at the same table where Lee dined. Dr. Denny briefly touched on Robert E. Lee’s military ability and of his genius for war, preferring to pay homage to the memory of Robert E. Lee the college president whom he declared to have had an educational philosophy far in advance of the age. He stated that Lee believed in training men bigger than any task which they might undertake but at the same time was patient with those less capable. The first school of engineering in the South was established by Robert E. Lee at Lexington, according to Dr. Denny, the development of such schools as those of journalism and commerce began in this university. General Lee’s business management was lauded by the speaker, his knowledge of young men and his influence was far reaching. Dr. Denny said that the first Honor System in America was established by General Lee, he spoke at length of his faith in men, of his dislike of flattery but of his never failing effort to give full credit where credit was due. His school was free from disorder, only on occasion of this kind being remembered during his college career. Dr. Denny in a graphic way painted a beautiful word picture of the scene at Arlington, of Lee’s departure from Appomattox. He told of those wonder letters, gems in literature, which Lee wrote to his daughter and which Dr. Denny declared would be of benefit in these days of unrest with their valuable lessons on every page. Lee’s dislike of hate, his plea always for direct truth, the charity of the man for those who attempted to wrong him, his splendid traits of character, always showing the true strength of the man, his deep religious convictions, his modesty, his dislike for notoriety were among the things discussed by Dr. Denny as being outstanding in the twilight of Robert E. Lee’s life and he proclaimed his the greatest man of his generation — one of the greatest men of all times. In the handsomely appointed assembly rooms the guests spent a happy social hour meeting two distinguished guests of honor, General Kennedy and Col. Meredith. The tea table, covered with lace over gold satin, was centered witha silver basket of yellow calendula and Art tapers burned in silver sticks. Mrs. Belle R. Harrison and Miss Gorgas poured tea which was enjoyed with assorted sandwiches, cheese rings and nut cookies. More than a hundred guests shared in the pleasures of the Robert E. Lee birthday celebration with the members of the R. E. Rodes Chapter and enjoyed the hospitality of Mrs. Luther Maxwell, Miss Marilou Marlowe, Mrs. Hettie Floyd Powers and Mrs. R. E. Hinson, hostesses for this occasion. After the war as more people learned about the man and his actions, he became admired and respected by the North and increasingly liked by the South. Sadly, much of this occurred in the latter part of the 19th century after his death in 1870. The Stone Mountain Commemorative Silver Half Dollar Coin with views of Lee and Jackson show against a portrait of Robert E. Lee.